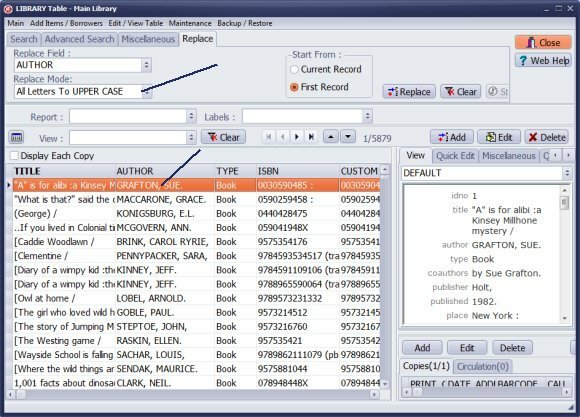 Help, how to topics > Library Main Catalogue > Searching, replacing the library databases. Searching, replacing the library databases. The Replace function helps you to replace the entire or the part of the field's content with a new value. Use this function with caution. It will check all currently displayed records. 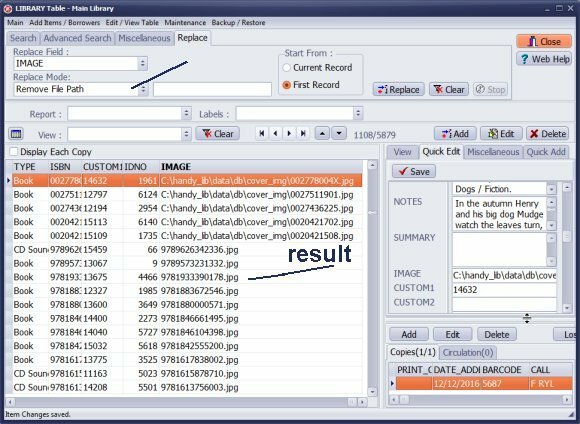 Make sure you selected the desired set of records using a search query (Search or Advanced Search). The replace process cannot be undone. This function is useful for users who want to make global changes on the selected field in the entire database. How much time does it take to change one field in a small database of 1000 records? The replace function needs only several seconds to accomplish this task. If the replace process is done manually it can take thousands of times longer, and also there is a chance of introducing some typing errors. The Replace function can be accessed from the Replace tab. Substring Only: select this mode if you would like to replace the part of the selected field. It will search for the text specified in the Substring To Replace edit box. Each found text will be replaced with a new value. All Letters To UPPER CASE: select this mode if you would like to replace all letters of the selected field to upper case. Auto-Increment: select this mode if you would like to number your records. Enter the initial value in the Start From edit box. The number that will replace the content of the selected field is incremented by one and starts from the value entered in the Start From edit box. Replace Entire Field Contents: select this mode if you would like to replace the entire content of the selected field with the Replace With string. For example you entered temporary data into CUSTOM1 data field. Now you want to clean the contents of this field. Use replace with empty string. Replace One Field With Another Field : select this mode if you want to replace content of one field with the content of another field. Insert In Front: select this mode if you would like to insert the text in front of the selected field content. 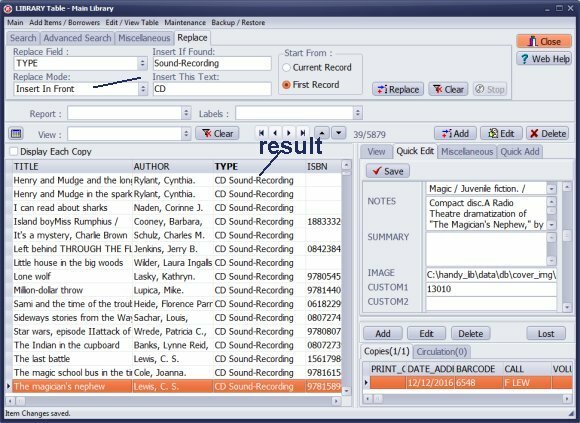 Insert If Found option: only records with Insert If Found text will be modified. If Insert If Found edit box is empty all currently displayed records will be modified. Remove File Path: it can be userful for Library Image Fields (for example, when the graphic files are moved to a different directory). 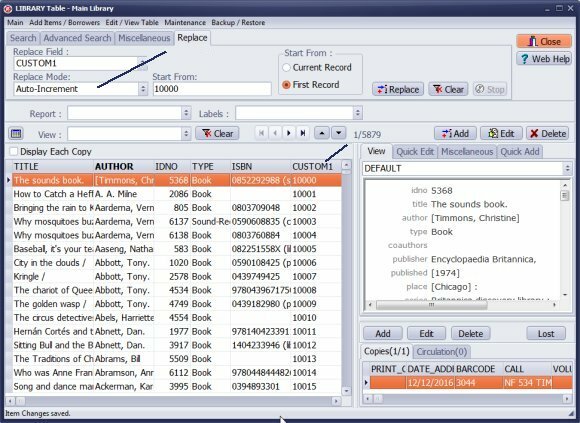 Question: If I have 50 books that have Reference in the CATEGORY field, is there a way to add Reference to the TYPE field in one procedure or do I have to type in Reference into all the TYPE fields of all 50 of the Reference book records? Answer: Use Advanced Search to display items that you would like to process, then use search/replace. Question: I had a user misspell FIICTION in the category column and now every time I start to type F, it fills in the misspelled word. How do I eliminate that? I tried fixing all the existing misspelled words, but it still seems to remember it. 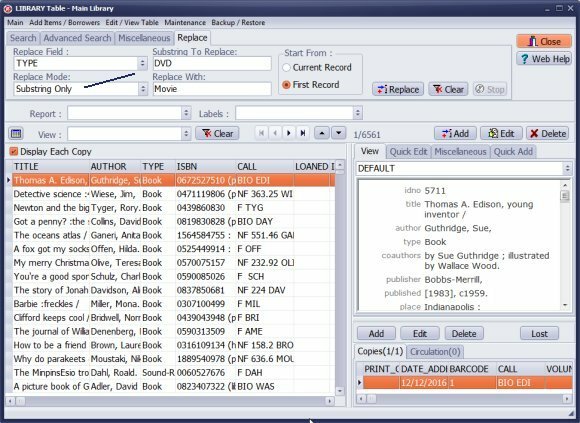 Answer: Use search/replace to crrect data entries, then go to Options/Maintenance, click Dropdown Lists, delete misspelled items. Question: Is there a way to change information in one field on multiple records at a time? 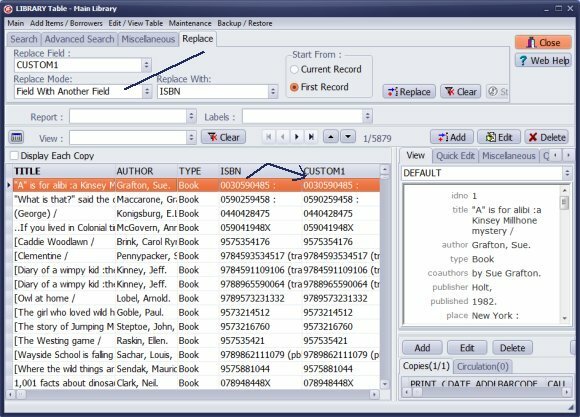 For example could I filter for brd books in one field and then add BOARD BOOK to the category field for all those records that match the query? 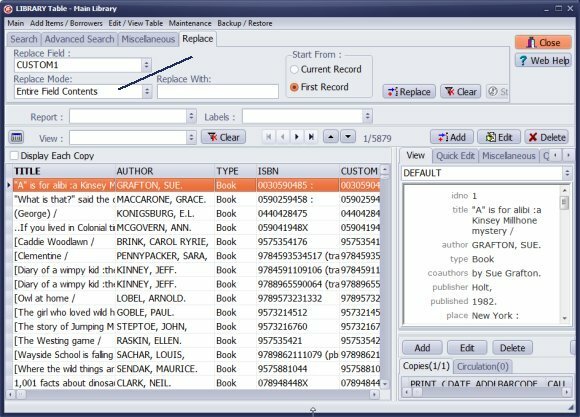 Answer: Yes you can do it, use Search or Advanced Search to filter your books and then define Replace. 1. For whatever reason, some of the volunteers misspell entries and authors names. In this example, we have 20 or 30 entries with author Danielle Steel incorrectly entered as 'Steele". 2. We've also had many cases where volunteers have entered barcodes and used letter O instead of zero. 4. Entered incorrect or inconsistent punctuation, like 'no space' after a comma, or multiple spaces after comma. 6. For readability, we wanted to change all text to 'all caps'. 7. Needed to do a simple spell check on the data. 8. During previous editing of original database, the port of data through a spreadsheet ended up dropping all leading zeros from our eight digit barcodes. This happens when spreadsheet format is set to numbers instead of text. We wanted to normalize and correct all the barcodes with missing leading zeros. However, the nature of many of these errors made them good candidates for some programmatic editing. To resolve most of the problems I just described, I had to move the data to a spreadsheet. Then I developed a number of macros and function strings that could detect and repair these systematic errors to the entire database, rather than case by case. I realize this is probably a single shot cleanup project, and once updated, we need to train and monitor the volunteers to keep it clean. But still, there is no way to prevent small groups of errors when you are dealing with volunteers. And many of the errors are actually recognizable by who entered them, meaning the same people tend to make the same errors over and over. So, this is bit of background of our real world installation. My suggestions and issues all come from things that I actually ran into. I don't know how often they will continue to appear, but our db is not very large (5000 items), and I know I've spent many, many hours just doing corrections. Some power tools for these kinds of issues would have been really great. Just saying. Answer: Search and Replace support is added in version 2.3.